Enterprise is a very well-known company that offers legitimate work at home opportunities. Enterprise hires representatives to work from home in their Customer Service, Reservation Sales and Escalation support departments. Customer Service reps are responsible for answering customer service calls as well as resolving complaints related to rentals. Reservation Sales Representatives take inbound calls from across the US and Canada assisting customers with reservations and other inquiries. Escalation Support Trainees are responsible for providing support to customers in escalated situations. Duties may include researching reservations, communicating branch policies, and resolving complaints. To apply, visit Enterprise’ Work at Home job listings. Enterprise is location based and requires that you are a US resident as well as a resident of the state that you are applying for a position in. They do not always hire nationwide, but you can check their jobs listings for available locations. Training time varies depending on the position and location. Positions may require anywhere from 4 to 11 weeks of virtual training. You will be financially compensated for your training time. Since you will be hired as an employee at Enterprise, you will be eligible for many benefits. These include Health, Dental and Life Insurance as well as Disability, Retirement and Paid Time Off. Perks such as discounts on a wide range of services and products are also offered. This may include discounts on things such as Daily Rental, Vehicle Purchase Plan, Child Care and Travel. Most positions are full-time and require you to work a flexible schedule that includes day and/or evening hours as well as both weekend days. The pay at Enterprise varies depending on the position. Customer service reps start out at around $12 an hour. Sales reps hire in at around $11 an hour, and Escalation Support Trainees earn $14.80 an hour. Employees have the opportunity to earn more money with monthly bonuses. 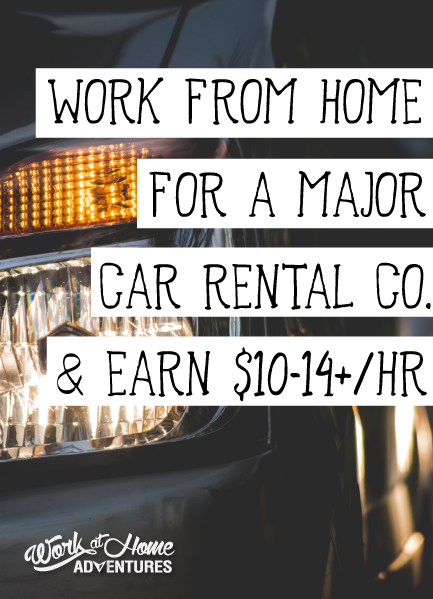 Visit the Enterprise Rent-A-Car Career Page and look under the Work From Home Category to find all available positions. Thank you for this post Miranda! First time on your blog, but I will be checking out more articles. God bless you!